Click above to watch interview with FarmLab’s Sam Duncan at evokeAG in Melbourne. 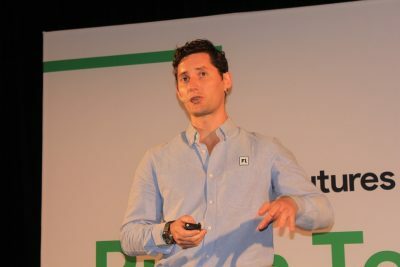 FARMLAB chief executive officer Sam Duncan began his pitch at the evokeAG conference in Melbourne with a smile and a simple message – we make soil testing easy. FarmLab CEO Sam Duncan pitching at yesterday’s opening day of evokeAG in Melbourne. Mr Duncan told his judges and the evokeAG delegates that the current soil testing system is “crap”, but FarmLab app could give farmers a clear indication of what is happening in their soil over the long-term and provide soil maps of farms that become assets in themselves. Oils ain’t oils & soil tests ain’t soil tests. If these tests are just the current test in a different format, what is the point? I think soil tests should reflect biological soil health measured by activity between plants and soil organisms. The old N,P & K measure offers nothing in terms of soil “health”. Great to see the innovation focus at Evoke Ag in Melbourne and the FarmLab guys – however not everything he says about the structure of soil testing is accurate – sure historically the system has been paper based however there is already a major project working at digitising Australian soil test data. Additionally companies like ours hold large amounts of soil test data digitally on behalf of our farming clients and agronomy partners. We expect to conduct in excess of 50,000 soil tests this financial year alone.